The floor plans of Late Victorian and Edwardian houses began to reflect the continually increasing standards of living and the rise of new domestic technologies throughout the periods. Whilst working-class houses and the homes of the wealthy did not change much in terms of style or size, houses targeted at the middle class generally became larger. One interesting development during the Edwardian period was the inclusion of the service rooms — kitchen, water closet, coal stores, etc — into the actual layout of the house itself.32 Victorian houses tended to have rear extensions attached to the back of the house which contained these rooms and effectively separated them from the main living quarters. The main purpose for this was to make the rear garden a more lively and presentable place where home owners could entertain guests without the service rooms intruding on the occasion. Other service rooms were relatively new comers to moderate-sized houses. The most obvious example is the domestic bathroom. By the Edwardian period, bathrooms had become standard in houses.33 Bathrooms were not, however, as are seen today as toilets were still located in a separate room called the water closet.34 Although many houses had contained some sort of indoor water closet as early as the High Victorian era, most were either built in later by the owner of the house or they were only to be found in the much larger homes of the wealthy. Bathing still generally took place in bedrooms or dressing rooms. Indeed, the idea of having a separate room exclusively for bathing was quite new itself, even in wealthier homes. Bathrooms first became widespread after centralised plumbing and water heating systems became popular. Whilst boilers were also used in High Victorian homes, they were generally only useful in the room in which they were located which was most often the kitchen. It wasn’t until the Late Victorian period when plumbing throughout the entire house allowed hot water from the boiler in the kitchen to be redirected to a different part of the house that having the tub situated in a fixed location made any sense. Before, hot water had been taken from the kitchen up to a tub in a bedroom or dressing room by pitchers rendering the location of the tub was entirely irrelevant. By the Edwardian era bathrooms had become an essential part of the house and were even included in many new working class homes.35 Whilst this was a significant addition to the working class house, larger houses underwent even larger changes during this period. The floor plans of larger houses designed for the upper-middle class changed quite significantly during the Fin-de-Siècle. Whereas in the High Victorian era, the front hall would usually have been quite narrow and restricted due to the general narrowness of the houses, Late Victorian and especially Edwardian houses tended to be wider, allowing for much larger central halls to impress guests as they first entered the building.36 This was especially true for detached houses. Located in the main hall was the house’s primary staircase. Ornamented with elegantly carved wooden trimmings, they were a often a source of pride for the home owner and therefore its central location played a vital role in presenting the owner’s home to guests.37 As in most layouts for High Victorian homes, public rooms tended to be located on the ground floor towards the front of the house. These were rooms such as the dining room and the parlour. More private rooms or rooms which were out of necessity supposed to be quieter such as the library and the drawing room were usually located towards the rear of the house. 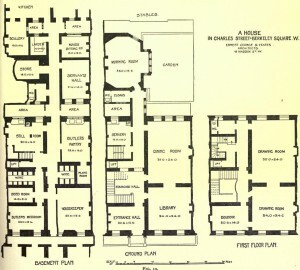 Service rooms such as the kitchen and scullery were also normally placed at the rear so that they were out of sight.38 Rooms on the first floor were primarily bedrooms, bathrooms and other private rooms, although some larger but narrow houses carried over the tradition from Regency and Early Victorian homes with the dining room and/or drawing room being located on the first floor. Smaller houses, however, did not change nearly as much as their larger counterparts. Throughout the Fin-de-Siècle smaller houses aimed at the middle class tended to carry on the layout traditions first established in the Early Victorian era. These were mostly terraced or semi-detached houses which were larger than their working class equivalents. The predominant changes were the addition of bathrooms and indoor water closets as well as the inclusion other service rooms into the house proper. Service rooms were still located toward the rear of the house, however. Due to the narrowness of these houses, the rooms were located one behind the other meaning that only one room could have been located in the front. As in larger houses, however, the most important public room would have been located at the front of the house. This would generally have been either the parlour or the dining room.39 Whereas the front door in working class houses would have opened directly into the front room, even narrow middle class houses would have had an entrance hallway with a decorative main staircase. This was a very important distinction between the two types of houses and was often one of the only distinguishing factors aside from pure size differences. Interiors in general were used in setting those apart who were socially and financially better off. 32 Yorke, The Edwardian House Explained, p. 107. 36 Hockman, Edwardian House Style : An Architectural and Interior Design Source Book, p. 28. 37 Yorke, The Edwardian House Explained, p. 73-75. This entry was written by Alex Seifert, posted on March 24, 2016 at 9:05 pm, filed under 19th Century, 20th Century, Architecture and Buildings, British History, Featured, Houses, Houses in Fin-de-Siècle Britain, Multi-Part Series and tagged Architecture, Britain, Fin de Siecle, Houses. Bookmark the permalink. Follow any comments here with the RSS feed for this post. Post a comment or leave a trackback: Trackback URL.